Most people seem to have missed the news, but Twitter added in-tweet polling this month. This is an interesting new feature, and one of the biggest changes to the platform in years, but there’s a problem: When viewing a poll in one of the many not-yet-compatible clients, just the text of the question appears. There is no indication that a poll was attached, leading to some weird, out-of-context possibilities. As you can see from this embedded tweet, Twitter’s polls are nicely composed when viewed on the web site. You are still limited to 140 characters (including the answers) but everything is neat and tidy. And once a logged-in user answers the poll, they can see the results immediately. After 24 hours, the poll is disabled and only the answers show. When services like Twitter add new features, it is best for them to “degrade” nicely for those using older or third-party clients. But this has never been the case for Twitter. When they added group direct messages, their existence was invisible outside new first-party clients. The same is true of longer-than-140 DM’s, and now this pattern has repeated with polls. 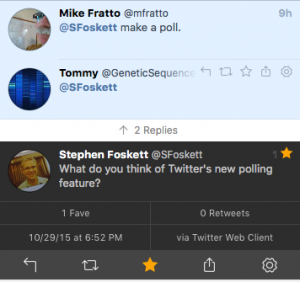 Here’s how that same poll appears in the popular third-party client, Tweetbot. Note that there is no indication that I intended to tweet anything beyond the question. In all three cases, it is disappointing that Twitter chose to hide critical content rather than showing it in an alternative way. And in all three cases a simple solution presents itself: Embed a link to the Twitter web site. This would be especially-easy for polls, since the answers use up some of your 140 characters. Surely they could reserve enough space to include the link while still preserving the question! 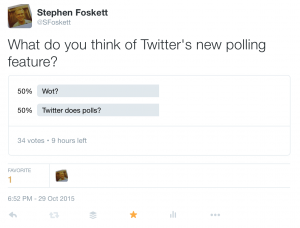 For example, my tweet could have read “What do you think of Twitter’s new polling feature? https://twitter.com/SFoskett/status/659865337630822400”. Alternatively, they could simply replace the tweet with “@SFoskett has posted a Twitter poll: https://twitter.com/SFoskett/status/659865337630822400”, though this would be sub-optimal since the reader would have no idea if they wanted to click through or not. This solution would have been vastly preferable to showing nothing at all for group DM’s, however. 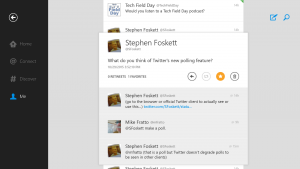 Here’s how a Twitter poll looks on an official client (Twitter for Surface RT) that doesn’t support polls. Still no dice. Note too that we aren’t talking about rogue Twitter clients here. Tweetbot is authorized by Twitter (if grudgingly), and Twitter for Surface RT by Twitter, Inc. is surely a first-party client. It’s not that these clients are “non-supported” by Twitter, they’re simply “non-supporting” of this new feature. With rumors swirling that Twitter will add longer-than-140 tweets in the near future, I am concerned. Of all the elegant solutions proposed, it seems that this Twitter, Inc. will likely choose one of the least-palatable options for non-supporting clients: Truncate them or simply don’t show them. This would be a terrible mistake. Please, Twitter, allow your new features to degrade elegantly and usably in the future!